Our answer is always invariably the same: “No”. In this post we shall explain the reasons why what appears to many as a good idea, is in fact a very bad one. He who chooses art mosaic over any other form of decorative coating, knows very well what he looks for. He appreciates exclusive beauty, durability, refinement. Using fine materials will increase the value of the artwork over time; conversely, cheap materials speed up deterioration. An artist applies his talent and experience, also in the careful choice of the materials he employs. It must indeed be his first choice, because his technical prowess reminds him that each material has a different application. 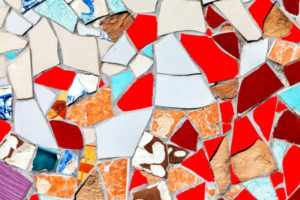 There are instances of mosaics made of broken tiles, which are in fact very beautiful. Anyone who has visited Barcelona, will know the visionary splendour of the works of Antoni Gaudí – and also many who haven’t. 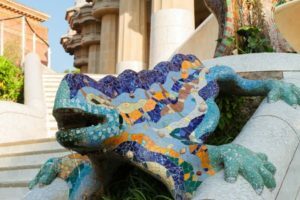 The catalan architect has left an indelible footprint in art history; in his houses of the unexpected shapes, in the sculptures of the Parc Güell, coated in mosaics of shining colours. Colours which keep on shining since a hundred years, in the Mediterranean sun; and millions of visitors have been bewitched by the artist’s works. What visitors don’t see however, or fail to appreciate, is how easily the tiles are damaged. And when they do stand a damage, it is painfully evident. Ceramic tiles used in buildings as coatings, are made of a mixture of natural and synthetic materials; the mixture is mostly made of clay or ceramic earth, with colour and enamel applied on the outside for the purpose of giving the tile a polished finishing, which will make it resistant to water, soap, detergents etc. The raw material, soft and pliable, is turned in a hard and resistant end product by keeping it at a specific temperature for a given time, in special ovens. Two alternative procedures are used: either cooking the raw material, then applying colours and enamel, and cooking again to consolidate the enamel; or cooking once only, with the enamel applied on the raw material. Two different procedures, each with its advantages and disadvantages, which we will not discuss here. However we all know that by cooking, the raw material is turned from a greyish dough to a solid, hard reddish-brown mass – the “terra cotta” colour. There is one sole exception to this, consisting of materials “coloured in the mass”. In their daily household use, tiles are placed next to one another to form a surface that is optically uniform, and it’s the same whether it is solid coloured material, or decorated in any way. It is also common experience, that a shock, maybe from a falling object, can chip off part of the coloured enamelled coating: out pops the reddish terra cotta colour. 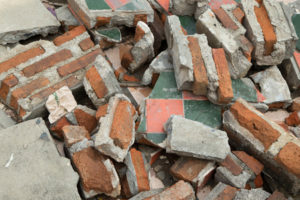 More often than not, the problem is quickly fixed: the damaged tiles are still available on the market, or a forward-looking landlord has kept a couple of boxes as a reserve “just in case”. A couple of hours of a layer, and the damage disappears (truth be told, sometimes the difference in colour in the grout-filled gaps can be seen; or you can tell a slight difference in the colour nuances of the decoration, especially when the manufacturer used non-sunlight-fast dyes). Now, something like this is much harder to remediate in a mosaic. 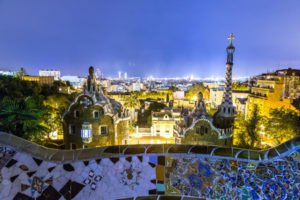 And you can tell when you visit Barcelona: millions of visitors admired the Parc Güell since it was opened to the public in 1926, but they left traces of their visits. Gaudí’s visions are still beautifully there; but the damages are also there, and you can tell. As mentioned above, the choice of mosaic means that the artwork must keep in time. The owner of the house that has been embellished by a beautiful mosaic, will enjoy it in the years to come. But this is only true, if the artist has done his job well: including making the correct technical choices, which are extremely important in a form of expression such as mosaic, which needs must be more than just the sum of the parts it is made of. Sadly, some mosaic making colleagues tend to underestimate the iron-fast rules of physics and chemistry. A mosaic is not barely a splendid vision of shapes and colours; it is also the material(s) which the tesserae are made of, the support it is placed upon, the mortar holding things together, the grout covering the gaps when required, and possibly a number of other small details which all work together to achieve a single end: making the artwork last as long as possible. A competent mosaic maker knows his materials, reads the technical pamphlets to learn physical and chemical properties, understands relationships between different materials and knows how to choose and place uneven materials next to one another the right way. Here is where we see one further problem in using broken tiles to make mosaics. Who can tell where the tiles come from? who collected them and placed them together? where were they taken from? are they factory-new or do they result from a demolition? how were they handled? how were they stored? what is their resistance to heat and frost? how much do they stretch with heat and shrink with frost? These aren’t just geeky questions from a mosaic nerd. Any engineer or architect can confirm that these are essential questions. And in fact, architects and engineers themselves ask the same questions, albeit in different contexts; because they need to plan for buildings which stay up along the years, rather than collapsing with the first windfall. 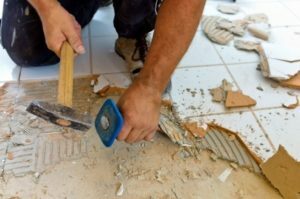 Research work on materials has shown that heat-frost cycles will make broken tiles fall off in a short time. Admittedly, Gaudí did not have such a problem in sunny, warm Barcelona; but in other climate conditions the problem is very relevant. Furthermore the heterogeneous materials in recovered tiles have different porosity grades. Porous materials absorb water; when water freezes, it splits. By now you will be asking yourself: all right, but can’t we still restore the artwork if needed? Restoration is a complex, controversial matter, and this is not the context to discuss it in depth. However we shall make a few points. The first is solid common sense: after we’ve invested money in a work of art, does it make any sense that barely a few years later we already need to spend more money in reworking the thing? But there’s more. At this very time as we are writing this post, the second world congress on Gaudí is taking place in Barcelona. Expert reports are issuing a warning call: the ongoing restoration works which have taken place over the years, due to over-exploitation by tourism, have reduced the original part of the mosaics to a skimpy 20%. We could argue forever on this estimate (which is what experts are doing) but one thing is for sure: Gaudí’s mosaics have required countless adjustments, overhauls and restorations over the ninety years they’ve been open to the public. Of course no work in a private environment must endure the wear and tear of a public park; but anyway it’s difficult to tell to what extent the damage is due to visitors’ neglect, and what stems from poor quality of the materials, or from little care given to physical and chemical compatibility of different materials. At any rate this is one of the reasons why, as we stated above, we do not make mosaics in broken tiles. A mosaic made with recovered materials is almost invariably like a painting by someone with hardly any technique. It may even be a pretty picture, but it will have little to do with Van Gogh, Raffaello or Kandinsky. An artist has talent and technique; the former you are born with, and the latter you learn at the expense of long years of study, sacrifice, discipline and experimentation. Beside a number of great figures, like the ones we just mentioned, and others of the like, there are countless minor artists, who are certainly talented, and have acquired their technique by studying appropriately. Their works may not be on display at the Louvre, but it doesn’t mean they are worthless. A simple trompe-l’œil requires great skills, expression, technique (think of perspective), sense of colour, balancement of shapes. The same applies to mosaic: the expression of art requires certitudes, among which the certitude of the reactions of materials. And we have seen that broken tiles have little certitudes to offer. Truth be told, broken tiles in mosaic have a specific context, which we approve of ourselves. In most cases it is either a hobby, or tuition. We have been requested to consult, every now and then, by schools or leisure centres, to support training activities for children, hobbyists or elderly people. In this context, recovered materials are an interesting, affordable opportunity to express creativity. For instance, children love them.